"What Will Our Children Lose Coalition" gathered oustide Meriden's Maloney High School. Educators, administrators, parents and students have called on Connecticut legislators to finalize a budget. They met to highlight their concerns after the education commissioner’s annual back-to-school meeting in Meriden Tuesday. 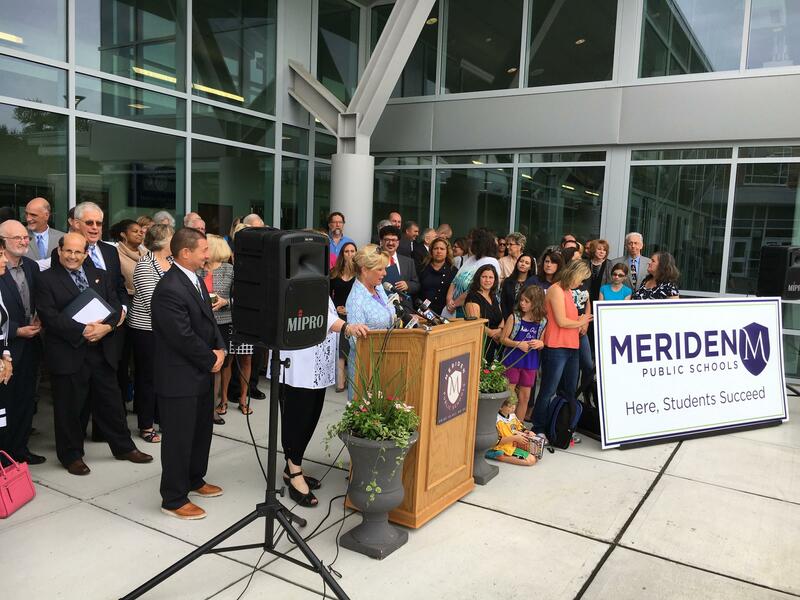 An education group called the What Will Our Children Lose Coalition gathered outside Meriden’s Maloney High School following Commissioner Dianna Wentzell’s annual address and urged lawmakers to get to work. Beth Horler, Groton Education Association President and a kindergarten teacher, said Groton’s Board of Education already made some difficult choices and cut their budget by $3 million in anticipation of cuts to the state’s education cost sharing funding. Without a state budget, school districts don’t know how much money will be available for teacher positions, supplies, and programs. That concerns Sophia Falusi, an 8th grader from Tolland. According to a survey of only 30 of the state’s school districts, more than 400 positions are either on hold or cut entirely due to the lack of a budget. More than 500,000 students are scheduled to start classes in a couple of weeks. Barbara Deindorfer lives in North Stonington, Connecticut. The 52-year-old cares for her older brother John, who has severe intellectual disabilities. She became the full-time caretaker for her brother two years ago, when her mother died.